Brand New oil filter kit for a 4x2 Gator. John Deere has never offered an oil filter as factory standard equipment on the 4x2 Gator vehicles. Get piece of mind about the cleanliness of your oil in your engine. This kit is easily installed. You simply remove a small cover on the engine, bolt the filter assembly in place of the cover and you are done. This is a small investment to help prolong the life of your engine. 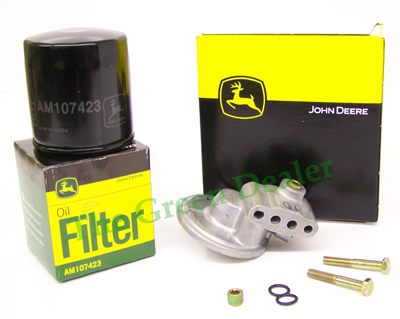 This kit also fits the John Deere TS, CS, & CX Gator, AMT 622 and 626. This kit works great. It fit with no issues and added oil capacity. For the life of me I can not figure why they did not install these from the factory!